But the partial nature of such collections, together with the geographical dispersion of the archives themselves, means scholars can only ever gain a fragmentary perspective. 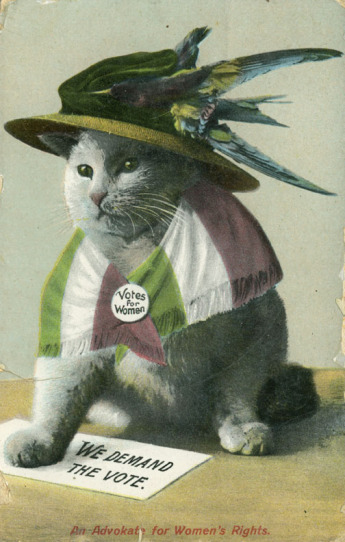 Though archives such as these are partially digitized, they are often largely inaccessible to the public… The Suffrage Postcard Project is therefore an attempt to bring together as many women’s suffrage postcards as possible, and thus create a replica archive… This replica archive centers upon women’s suffrage postcards in a way that fragmented collections cannot and is also easily accessible to the public. For example, observable trends become incontrovertible when analyzed using digital methods. A scholar might discern that upper-middle-class adult white women are the primary subjects of suffrage cartoons. However, when this impression is considered across hundreds of postcards, other trends emerge: children and animals are ubiquitous; men often appear as the subject of debate; white working-class people are depicted somewhat regularly; racial stereotypes about Irish and Chinese immigrants are evident, although rare; and African Americans are conspicuous due to their absence. Scholars were not formerly unaware of such trends, but a digital humanities approach provides stronger evidence for such thematic claims.